vedictruth: Who Killed Swami Vivekananda? Swami Vivekananda is famous for his Chicago speech and his association with Rama-Krishna (RK) Mission. There is also another part of his life. He widely criticised Christian Missionaries for their conversion tactics and constant attack on Belief and principles of Hinduism. Bengal became a nursery for Christian missions.K. C. Banerji ,M. L. Basak,Lal Behari De and Madhusudan Dutta were among few born to rich Bengali Brahmins but converted to Christianity. They even became forerunners in propagation of Christianity in Bengal. Brahma Samaj of Keshub Chandra Sen was different from Brahma Samaj of Raja RamMohan Roy. Raja ji possed biggest opposition to Christianity while Keshub turned to biggest admirer of his times. Bengali man was wandering from here to there due to lack of proper Guidance and knowledge. In this article we will like to know about the views of Swami Vivekananda on christianity. Bible failed to impress Vivekananda.He said that the sayings, precepts, or doctrines which the New Testament preaches were already in existence among the Jews before the Christian era, having come from different quarters, and were being preached by Rabbis like Hillel and others. The miracles of Christ also failed to impress Vivekananda. In fact, they repelled him strongly. What were the great powers of Christ, he asked, in miracles and healing, in one of his characters? They were low, vulgar things because he was among vulgar beings. He even criticised Christians and said that they go wrong only when they insist that Christ is the only saviour.Yet it was Christ that Vivekananda found missing from Christianity. He wondered which Church, if any, represented Christ. All churches were equally intolerant, each threatening to kill those who did not believe as it did.22 The person of Christ rather than his teaching had become more important for Christianity. He had been turned into the only begotten son of God.23 Christian baptism remained external and did not touch the inner man. It aimed at instilling some mental beliefs and not at transforming human behaviour. Most men remained the same after baptism as they were before it. What was worse, the mere sprinkling of water over them and muttering of formulas by a priest made them believe that they were better than other people. Swami Vivekananda was aware of what Church did to Galileo and other advocates of Science in Europe. He said that Christianity had spread with the help of the sword since the days of Constantine and tried to suppress science and philosophy.Hindus have nothing to gain from Christianity as it is only a system of superstitions. Hindus should not get frightened when the missionaries threaten them with hell; in fact, hell is better than the company of a Christian missionary. There came a Christian to me once, recalled Vivekananda, and said, You are a terrible sinner. I said, Yes, I am. Go on. He was a Christian missionary. That man would not give me any rest. When I see him I fly. He said, I have very good things for you. You are a sinner and you will go to hell. I said, Very good, what else? I asked him, Where are you going?I am going to heaven, he answered. I said, I will go to hell.That day he gave me up. If Christ could help people become good, why has he failed in the Christian countries where he has been worshipped for so long? Here comes a Christian man, continued Vivekananda, and he says, You are all doomed; but if you believe in this doctrine, Christ will help you out. If this were true - but of course it is nothing but superstition - there would be no wickedness in Christian countries. Let us believe in it - belief costs nothing - but why is there no result? If I ask, Why is it that there are so many wicked people? They say, We have to work more.Trust in God but keep your power dry! The missionaries were highly critical of the Vedas which Hindus have always held in the highest esteem. 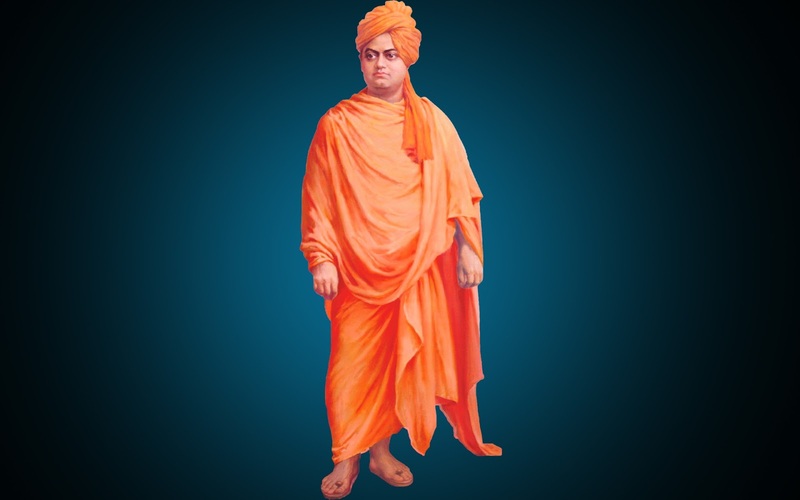 Vivekananda upheld the Vedas as depositories of divine wisdom.Rather than processing the Vedas in terms of the Bible, as the Brahmos had started doing, the Bible should be weighed on the Vedic scale and prove its worth. So far as the Bible, he observed, and the scriptures of other nations agree with the Vedas, they are perfectly good, but when they do not agree, they are no more to be accepted. On another occasion he said, It is in the Vedas that we have to study our religion. With the exception of the Vedas every book must change. The authority of the Vedas is for all time to come; the authority of every one of our other books is for the time being. Brahmanas were the next target of missionary attack. Vivekananda stood by these custodians of Hinduism. The ideal man of our ancestors, he said, was the Brahmin. In all our books stands out prominently this ideal of the Brahmin. In Europe there is my Lord the Cardinal, who is struggling hard and spending thousands of pounds to prove the nobility of his ancestors and he will not be satisfied until he has traced his ancestry to some dreadful tyrant who lived on a hill and watched the people passing by, and whenever he had the opportunity, sprang out and robbed them... In India, on the other hand, the greatest princes seek to trace their descent to .some ancient sage who dressed in a bit of loin cloth, lived in a forest, eating roots and studying the Vedas... You are of the high caste when you can trace your ancestry to a Rishi, and not otherwise... Our ideal is the Brahmin of spiritual culture and renunciation. As he heard the malicious propaganda against Hinduism which missionaries were mounting in America and saw their methods of raising money, he hit them hard.He warned the missionaries about the effect which their propaganda was having on the moral and mental health of people who listened to them. There was a corollary to Vivekananda's defence of Hinduism and critique of Christianity, particularly of the Christian missions. He called upon Hindu society to open its doors and take back its members who had been alienated from it by foreign invaders. Christian as well as Islamic missionaries were taking advantage of Hindu orthodoxy which was reluctant to receive those who had been forced or lured away from the Hindu fold but who were now ready to return to the faith of their forefathers. Vivekananda viewed this orthodoxy as nothing but a blind prejudice induced by the Hindus deep distrust of imported creeds. The distrust he regarded as well founded but the prejudice against victims of force or fraud as unjustified. Swami Dayanand, the founder of Aryasamaj laid stress on Swadeshi and Swarajya and forcefully identified Christianity as a crude cult suited to savage societies. He authored 13th Chapter in Satyarth Prakash as a critical examination of the principles and beliefs of Christianity based on Bible. The missionaries themselves watched him for some time, for it appeared as if he was making things uneasy for them.Swami Dayanand gave birth to a new movement - Shuddhi (purification) of those who had been enticed away from Hindu society at one time or the other. It sent a wave of consternation through the missionary circles and restored Hindu confidence.Dayananda's work was continued after his death by the scholars of the Arya Samaj. Compared to the South India and East India, the progress of Christianity has been very, very slow in the North. The credit for reversing the trend in the North goes overwhelmingly to the lead given by Maharishi Dayananda and the Arya Samaj he founded. Swami Vivekananda was an ardent admirer of Aryasamaj Shuddhi Campaign. The Bengalee newspaper Dated 7th, August, 1901 mentions Shuddi of Babu Bhawani Kishore Bhattacharya, a Bengali man born in respectable Brahmin Family. He was converted to christianity when he was Boy. Under the auspices of Aryasamaj he was purified in Ripon College. The ceremony was attended by many noble persons with full sympathy and enthusiasm. He was attracted towards Aryasamaj by reading preaching's and tracts authored by Thakur Kahan Chandraji Verma, the President of Aryasamaj. The Shuddhi Ceremony was greeted by reading a letter of none other then Swami Vivekananda who expressed his fullest sympathy with the movement and deep sorrow for his inability to preside on account of ill health. This news is mentioned in book name Christ a myth authored by Thakur Kahan Chandji Verma. Vivekananda views on Christianity were to be adopted by RK mission. Vivekananda who was RK dearest disciple had viewed Islam and Christianity not as religions but as doctrines of the sword. But just contrary to our belief they went totally against him. Today the RK Mission has become a world-wide network, and a wealthy institution patronized by the high and the mighty, not only in India but also abroad.Now they celebrates Christmas on 24th December eve. Just ignoring to what Swami Vivekananda had said about Christianity. They wanted to promote the secular image of their mission. It is nothing more then keeping the educated followers of Mission unaware about the Truth. They have never thought that Christian missions in Bengal are engaged in converting poor Hindu tribal's to Christianity by unruly means and tactics. They never thought that Church representatives visits uneducated villages of Bengal and tries to prove that Christianity is best and all practices of Hindus are pagan worship and thus superstitions. They never thought to utilize their funds and powers to save Hinduism in Bengal. No to forget the mission once went to court o prove themselves that they are not Hindus. "The killers of Swami Vivekananda are none other then RAMAKRISHNA MISSION".